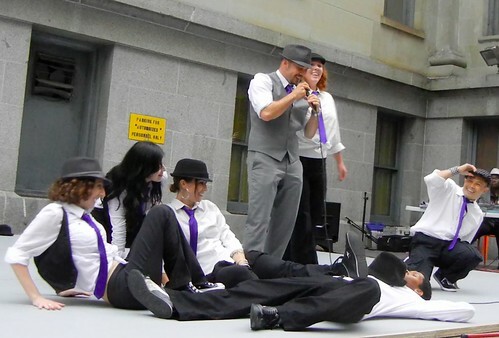 Today I performed with the FreePlay Dance Crew at the Central Market Arts Fair in downtown San Francisco for a crowd of about 50 passersby. This was the culmination of just four weeks of work together, twice a week. And yet, I think we put together a fun, entertaining and unique "fusion" dance piece. It was really neat doing a hip-hop routine to the jazz song "Route 66," bringing together many of my own musical and dance influences. I even got to do a couple of breaking solos during the bridge that went really well. I can't wait to see the videos and pics from our performance! And I'm looking forward to working and playing more with the awesome dancers in the FreePlay Dance Crew.